You don’t need to be sitting on a mountain of earned miles to upgrade to Business or First Class cheaply. You can buy them instead. Most airlines sell miles, and cheaply when they put them on sale, which is often. There’s often a limit to the number of miles you can purchase. And since miles aren’t transferable from one mileage account to another for free—yes, you can gift miles (or share them) to someone else, usually at a fee of about 1¢, but even these miles come with a limit—you can be caught short. But there is a better way to get around mileage-purchase limits. We love this move because it quickly gets you into the upgrade game. Most airlines allow you to redeem miles from your account for someone else’s travel. So just reverse the process: Open an account for your dad, daughter, or other family members or friends, fill it with miles when miles go on sale, and then use the miles for your ticket. Once you have these other mileage accounts set up, you can buy the annual maximum for each account when the miles are on sale, giving you almost unlimited access to miles for travel. Buy miles during a sale up to the annual limit. Set up another account in someone else’s name and repeat the process. Think one-way: Buy one-way outbound on one account and one-way home on another account, if you must. Take a recent United MileagePlus sale. Here’s the link. It ended Dec. 31, and offered up to a 100% bonus, which came to about 1.9¢ per mile. United has a yearly maximum of 150,000 miles they allow you to purchase, which works fine for most Business Class awards, but not for international First Class awards, as these often start at 160,000+. But you can circumvent that by booking two one-way flights, each using a different mileage account. Chicago – Tokyo on United: Thanks Mom! In First Class the lowest fares starts at $12,688, or would require 180,000 miles round-trip. That’s well over the 150,000-miles maximum. But if you took advantage of the United December deal using your account and the one you set up in your Mom’s name—90,000 for each account—the cost would have been about $3,676. In 2017 we saw miles on sale as low as 1.9¢ with United, 1.8¢ with American, 1.5¢ with LifeMiles, and 2.1¢ with Alaska. These are the four biggest mileage sellers. Thinking ahead: The airlines know that you will be reading this, so they have put a small obstacle in the way of mileage purchases: A waiting period before you can buy miles. American and United impose a 10-day waiting period, while Alaska imposes a 30-day period. LifeMiles only asks that you be an existing member in order to buy miles when they are on sale. Figure this into your plans and set up mileage accounts in advance to buy miles when they go on sale. 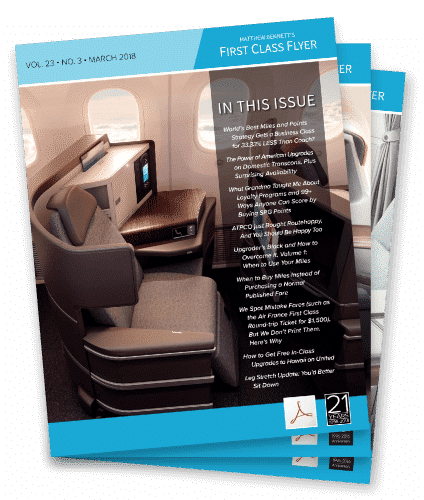 For more on how to play the “Buy Miles to Fly In Style” Strategy to Net Up to 90% Off Premium Travel’ see our June special report. which are generally NOT available anywhere else. Inventive Premium Ticketing Strategy Nets Business Class for 33.33% LESS Than Coach?